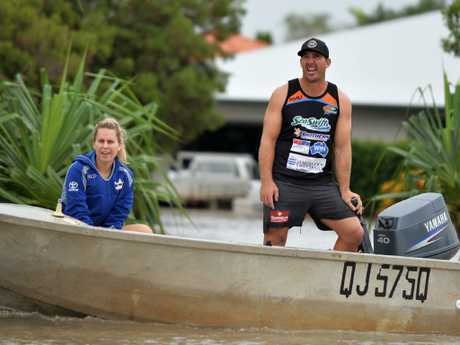 FOOTBALL has taken a back seat during Townsville's unprecedented flood crisis, but Cowboys players still leapt into action to help their community as part of the "tinny navy". 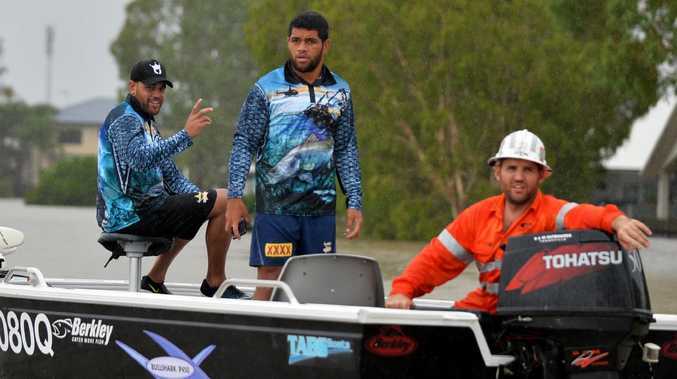 Forward John Asiata and former star Antonio Winterstein were captured using a boat to rescue residents who were stranded around Idalia, which included several Cowboys players and staff. 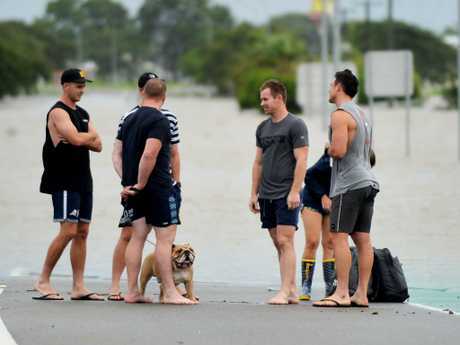 Prop Scott Bolton was also out on the water and helped team mate Ben Hampton bring his two dogs to safety after his home was inundated while veteran forward Gavin Cooper and his family had to be helped out of their house by Asiata. Footage captured by Winterstein's wife Brooke on social media showed the moment the NRL stars dropped two young boys off as they offered assistance to anyone else in need. Halfback Michael Morgan, forward Shane Wright, and former player Glen Hall also lent a hand even after Hall and Wright had to be evacuated from their own homes early yesterday morning. Idalia has been one of the worst affected areas during the flooding and Cowboys coach Paul Green said it was no surprise that the players were eager to help out wherever they could. "It's good to see, but it doesn't surprise me at all. They're a pretty good bunch and they're very aware of how important the community are," Green said. "As soon as they and their families are safe then they straight away look to see how they can help someone else." The Cowboys have felt the devastation of the floods with players including Hampton, Cooper, Jake Granville, Ethan Lowe, and Nene Macdonald all forced to leave their homes along with coaching staff David Fairleigh, David Tangata-Toa, and high performance chief Michael Dobbin. "We're a big part of the community and like everyone else it's definitely affected us," Green said. "We had a fair few staff and players that live in Idalia so that was one of the most affected suburbs. "A couple of them got caught out a little bit and had to get evacuated through the night. "Most of them have got young families too so it was a bit daunting for them. "They ended up in the Lavarack evacuation centre so we've been running around trying to get them out of there this morning (Monday) and get them some places to stay."